Another look at the forthcoming Moto X? Judging by a photo that emerged online late Friday evening, it seems Google chairman Eric Schmidt wasn't the only person to get his hands on the Moto X this weekend. Just hours after Schmidt was photographed using a mystery Moto device, Android Central received a photo from a reader who claimed to be holding the company's forthcoming flagship smartphone. Now, unless it's a child holding the device, it doesn't appear that the handset pictured (apparently it's the Verizon version) will smash through the 5-inch barrier as many recent smartphones have done. 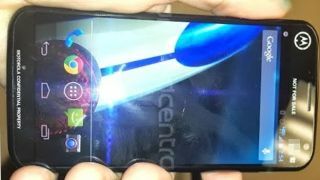 The apparent size, as well as the shape, rounded edges and rather sizeable bezels mean the device strongly resembles last year's 4.7-inch Google Nexus 4, which was made for the company by LG. The handset is also emblazoned with "confidential Motorola property" and "not for sale" stickers, also suggesting the sly photographer has his hands on the real deal. Beyond the phone's design, AndroidCentral also points out a slight UI change that could indicate the device will ship with a new version of Android Jelly Bean. As you can see from the photo above, the background behind the on-screen soft keys is transparent, while the same keys are solid black in Android Jelly Bean 4.2.2. This small, but potentially significant, change could easily represent a minor UI adjustment from Motorola, or it could be a sign that the heavily-rumoured Android 4.3 update will ship with the device. The latest indications are that Moto and Google won't be released until August 23 so it might be a few weeks until we find out for sure. More leaks on Friday listed custom backplate materials for the "designed by you" handset. Fancy a ceramic smartphone anyone?